If you are like me you have grown accustomed to your exponentially growing genealogy “to-do” list. You don’t like it, but you know it is not going anywhere. Every family history fact, photo, or document discovered usually leads to a dozen more questions to answer or leads to follow. You have irrational hopes of “completing” the list but you realize there is no ending. You have a full time job, or are busy raising kids or taking care of parents. There isn’t a lot of extra time to complete some of the genealogy tasks that you want to. Sometimes “The List” overwhelms me! When this happens I often find myself aimlessly scrolling through facebook or youtube videos instead of tackling the genealogy tasks at hand. If you break your list down into SMALL and ACHIEVABLE chunks you will stay motivated and get much more accomplished in the long run. This goes for genealogy and, frankly, life in general. This is a mainstay piece of advice I give to my psychotherapy clients struggling with procrastination. It is also a principle I try to employ in my own life and genealogy pursuits. 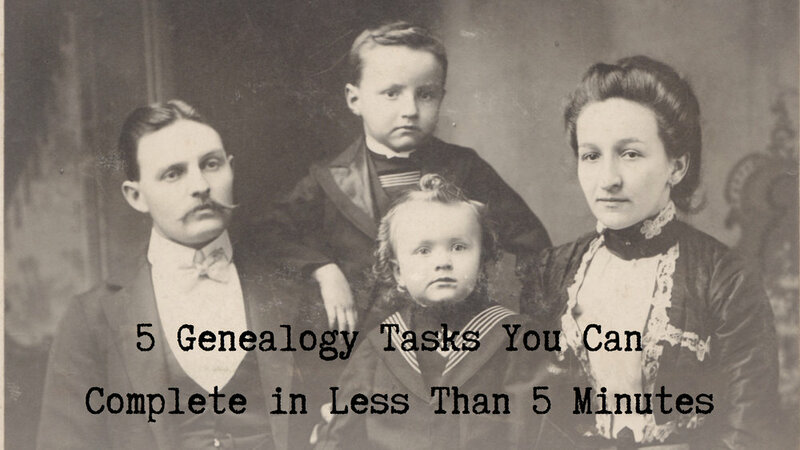 Here is a list of five genealogy tasks that you can complete in under five minutes! 1. Email one family asking for dates of birth and marriages. As genealogists we spend a lot of time looking in the past. Sometimes WAY in the past. I find that I have more information (e.g. birth, death, and marriage dates) for several generations before my own current generation. If you have some gaps in your tree, email a cousin and ask them for this information. Relatives years from now will thank you. 2. Take one relative in your Ancestry.com family tree and clear ALL of their suggested hints. 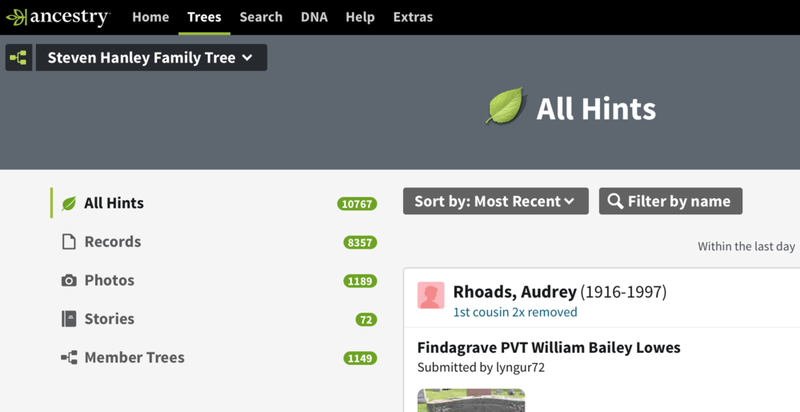 I currently have about 2000 people in my ancestry.com family tree and over 10,000 hints (yeah, that’s too many, I know)! There are probably several relatives in my tree right now with 10 or more of those shaky leafy hints. I’ve gotten in the bad habit of either saying “yes” to hints I am confident to be true or just taking no action. The problem with taking no action is that a week from now I might have to review the very same information and this is an inefficient use of valuable genealogy time. Ancestry gives you the option to say “no”, “maybe”, or “yes” to most hints. Use this to your advantage and make a decision right then. Don’t worry, Ancestry keeps track of the decisions you have made for each hint. You can always go back if you think you made a mistake. The decisions are often an obvious “yes” or “no”. Sometimes you truly don’t have the information you need and “maybe” is the most appropriate. 3. Request one missing death record. Many death certificates are available online either through Ancestry.com, FamilySearch or other sites like seekingmichigan.org in my home state of Michigan. For more recent death certificates, however, you might have to mail away to the state. Many of my relatives are from Michigan. Here is the link that describes the process for birth, death, and marriage records for Michigan. You can find the form to fill out here. You need to know some very basic information a fee ($34 for basic service). They say that the processing time is about five weeks but I have generally received certificates back in about three. Anyone in Michigan can request a copy of a death record (i.e., you don’t have to be a family member). You just have to state the reason, which could be as simple as “genealogy”. Every state has their own rules, so you might need to do some research ahead of time. 4. Scan five family photos. I have multiple photo archiving projects going on at a time. I often have to gear myself up mentally if I am anticipating a few hour stretch of photo scanning. But, I have found that in about five minutes I can scan five photos on my Epson WorkForce 3640. Depending on the size of the photo, that’s about how many I can fit on the scanner at one time. This scanner has an “auto-detect” feature that does a good job of automatically detecting photo edges so I don’t have to manually crop them. Occasionally I do have to do some minor manual adjustments, but it is not too time consuming. I have a small “working file” of photos next to the scanner so I don’t have to dig out huge boxes of photos every time I want to do a mini scanning task like this. 5. Post one unidentified photo on your private family genealogy facebook groups. I am the administrator for two private family genealogy facebook groups, one each for my maternal and paternal sides. I have lots of partially and some fully unidentified photos in my collection. I will often get helpful input from family whose memories might be jogged after seeing a photo. I’ve identified many photos this way. I refer to it as “crowdsourcing” my genealogy research. Don’t worry, if you don’t have a genealogy family facebook group you can send out a group email and get similar results. Can you commit to doing one of these tasks (or one like it) each day for the next 30 days? This is above and beyond whatever longer genealogy research sessions (e.g., library trips, cemetery visits, writing sessions) you might have completed. I would love you to give it a try and let me know about your results. Are you hosting a Thanksgiving or holiday gathering this year? If so, it is a great time to explore, share, and celebrate your family history. Whether you are a serious genealogy buff or new to exploring your family story, here are 5 simple and fun activities you can try. Older PostThe Psychogenealogist Pic of the Week (#106): "Heard You Were Lonesome"